What goes into the pigeon holes of MPs matters to them and security personnel. And when the pigeon holes were stealthily stashed with pro-homosexual content yesterday, security officials were shocked and confused. The Observer has learnt that a woman sneaked into Parliament with copies of the offending magazines and stashed them in the pigeon holes unnoticed. According to reliable sources within Parliament, the magazines were delivered at Parliament on Wednesday at about 11am by a woman, identified as Ruth Muganzi, a project administrator at Kuchu Times Media Group Limited and stashed in at least 40 pigeon holes. Muganzi, according to a parliamentary police source, was cleared after submitting her credentials to the security personnel and said she was delivering information packs for legislators. She later proceeded to the Southern wing reception area, which is close to the chambers where the MPs' pigeon holes are located. "The magazines were sealed like an A4 envelope and it looked like papers that had been stapled together so you could not tell that it was a magazine because it looked like a letter," a source at the reception area revealed. 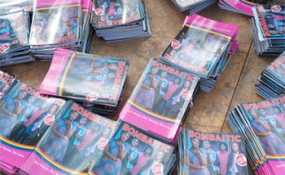 Among the recipients of the magazine titled Bombastic Magazine was David Bahati, the minister of State for Finance and Ndorwa West MP, who was the architect of the Anti-Homosexuality Act passed in December 2013, which outlawed homosexuality acts before it was annulled in August 2014. Abdu Katuntu (Bugweri) who strongly supported the legislation also got a copy. The magazine, which is founded by pro-homosexuality activist Kasha Jacqueline, highlights several stories of people in the Lesbian, Gay, Bisexual and Transgender (LGBT) community, justifying their quest to fight for their space in the country. Officials from the Department of the Sergeant At Arms learnt of the magazine drops after one recipient reported the matter to the receptionists. They immediately swung into action and retrieved the material. Only 25 copies were recovered, meaning that at least 15 MPs still have the book. The magazines were taken to the Office of the Clerk to Parliament. "The copies were taken to the office of Paul Wabwire, the deputy Clerk Parliamentary Affairs, who scrutinized the magazines but has found that they are inappropriate. They will also be given to the Clerk for her final word," the source familiar with the matter told The Observer yesterday. According to online information, the copies distributed to the legislators are part of the third edition of the magazine, which was launched yesterday and is being distributed in the Kampala metropolitan area. Chris Obore, the director of Communications and Public Affairs (CPA), told The Observer, "Trying to smuggle illegal materials into Parliament is a gross act of provocation. Fortunately, security at Parliament was very robust and we realized this early." Obore said security personnel reviewed CCTV footage to retrace how Muganzi got onto the premises. "As Parliament, whoever wants to deliver items like letters and parcels writes to the Clerk's office giving notice of the delivery. However, Muganzi and her group did not give prior notice. But, we shall remain vigilant and ensure this does not happen," Obore stated. Yesterday, Muganzi laughed off claims by Obore that her action was provocative. She said by telephone that their organization was merely sharing information with MPs. "We are only providing information which we thought is important for their jobs," she said. "If they require more explanation from us on the content of the magazines, we are willing to meet them at Parliament."